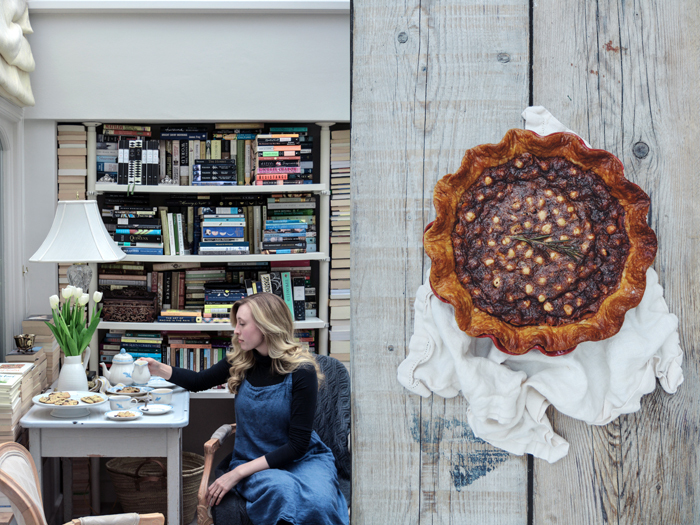 Jo’s hands, an open book on a wooden table, and a cup of tea are the reason for this meet in your kitchen feature. A few months ago, I came across the Instagram account of this gorgeous American woman living in London and since then, I basically follow her activities every day. There is a kind of peace in her pictures that struck me immediately. In the beginning, her images often showed her hands turning the pages of her current favourite book surrounded by snacks and nibbles and a cup of warming hot chocolate or tea, or a glass of wine. And all this accompanied by her beautiful words describing the scene in her cosy cottage in the heart of London. Jo used to work as an editor at Random House and a literary agent at WME but, since she became a writer for Vogue a few months ago, her little Instagram stories shifted from books to exciting trips to the English seaside, the Provence, the English countryside, and – my favourite – a luxurious railway journey with the Belmond Royal Scotsman through Scotland. 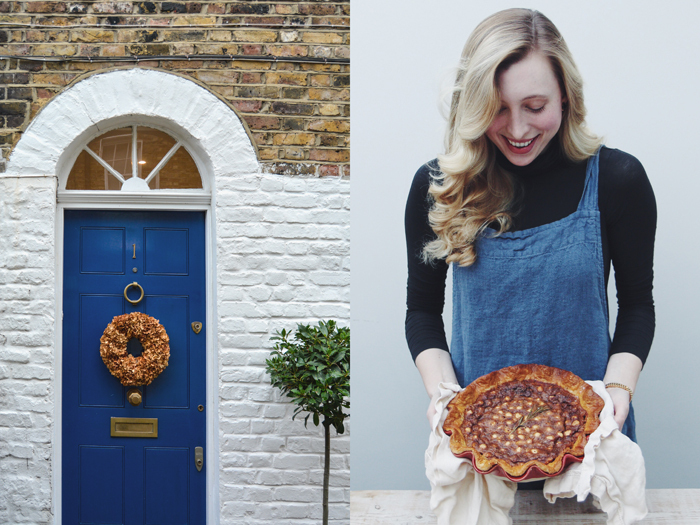 When she also started writing about cosy treats such as the perfect omelet, stuffed pumpkin, cranberry muffins, and mince pies, I knew I had to meet this woman during my stay in London a couple weeks ago. Where shall I start, we planned to bake a pie together but I was late and London’s light is not very forgiving. 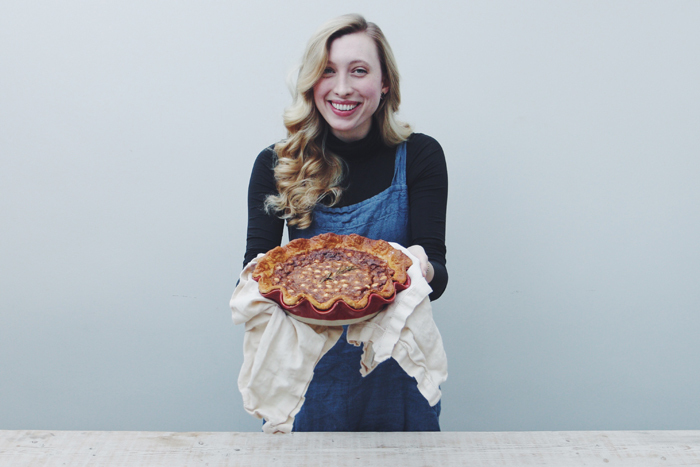 To avoid shooting this sweet beauty in the dark, her husband Andrew was so kind to take all the pictures of the pie. Thank you so much for that! In the end, the two of us didn’t spend much time in the kitchen, instead we spent four hours chatting, drinking tea, eating delicious chocolate chip cookies baked by her husband (the poor guy must pray that I’m not coming back soon seeing how much work I caused him! 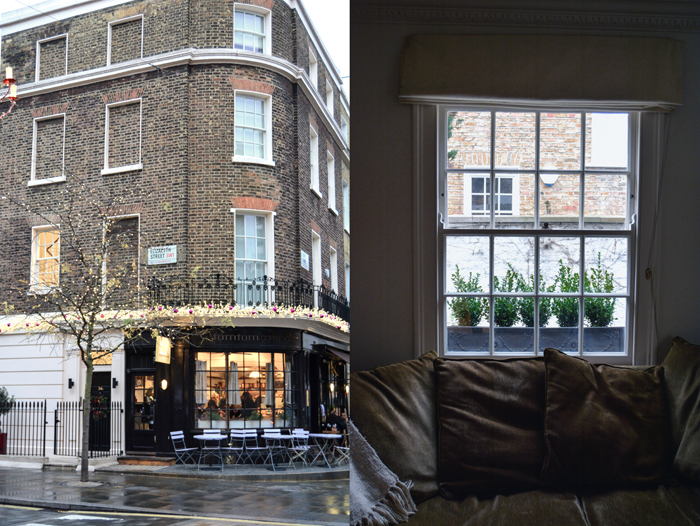 ), and we finished our afternoon with a walk through Belgravia. I call it her village, Jo showed me William Curly‘s fantastic chocolate shop/ patisserie, the Poilane bakery on Elizabeth Street, her butcher, flower shop, her pub and favourite restaurants. After an hour of strolling around with her, I could have moved to this quiet – not very London-like – neighbourhood. Besides having a wonderful girls afternoon, I can say that I found a friend. Jo and I had never met in real life but as soon as the fair blond woman opened the iron gate that leads to the yard in front of her navy blue door, it felt like we’d known each other for years. Jo is very calm and humble and has an honest kindness that comes straight from her heart. Her life is extremely interesting and it’s so exciting to hear about it, although she herself wouldn’t agree on that. She lived in Australia, Chicago, Boston, New York City, and since 2010, London. Jo studied 19th century British literature and would love to write a novel one day if her busy life would offer a little more free time. She has a beautiful way of playing with words, which makes them flow like a smooth river. Reading her articles is fun, so much so that I can’t wait to hold her book in my hands one day. So we made a deal, from now on I will start bugging her and asking her every few months if she started working on it. 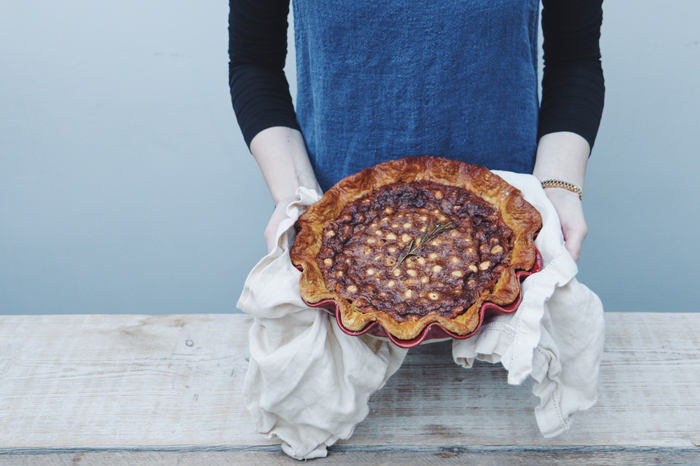 Jo shares her delicious pie recipe with us: a rich, buttery Chocolate, Hazelnut, and Rosemary Pie – she calls it a grown-up pie! You can read all of Jo’s articles for the American Vogue here. On a flat work surface, combine the flour and salt, then incorporate the cold diced butter with your fingers. Rub the butter into the flour until the butter pieces are no larger than the size of peas. Make a well in the center of the flour, and pour in the cold water. Using your hands, mix the water into the flour until dough is formed. Wrap the dough in plastic and put in the refrigerator for one hour. Preheat your oven to 175 °C / 350°F . Toast the hazelnuts in the oven until they begin to get fragrant, about 7 minutes. Let the hazelnuts cool, then rub off the skins; you can do this with your fingers or a cloth towel. Roll out the dough wider than your pie mold (there should be plenty of dough for any size or shape of pie mold; mine is quite deep, and there is still quite a bit of dough left over). Gently lay the dough into the mold and trim the overhanging dough with a sharp knife. Put the pie mold back in the refrigerator while you make the filling. In a medium-sized bowl, combine eggs, corn syrup, sugar, melted butter, salt, and vanilla extract. Stir in the chopped rosemary. Take the pie mold out of the refrigerator, and brush the edges of the dough with milk. This will help the pie to brown nicely. Spread the chopped chocolate evenly over the bottom of the pie. Pour the filling over the chocolate. Arrange the hazelnuts in concentric circles on top of the filling. Place the single sprig of rosemary in the center of the pie. Bake for 50 minutes, until the pie is browned and bubbling. Remove from the oven and let cool for one hour before serving. 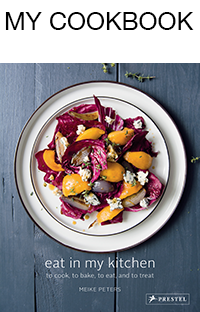 Serve with a dollop of mascarpone or crème fraîche. You moved from New York City to London nearly six years ago, and decided to stay. What do you love about this city and your life here? What turns a place into a home? I love New York, but I think that London is the best city in the world. When I’m away for too long I get homesick, and when I see it again from the airplane my pulse jumps. A sense of community is what turns a place into a home. Neighbors you bump into at the bakery, friends you have over for supper. 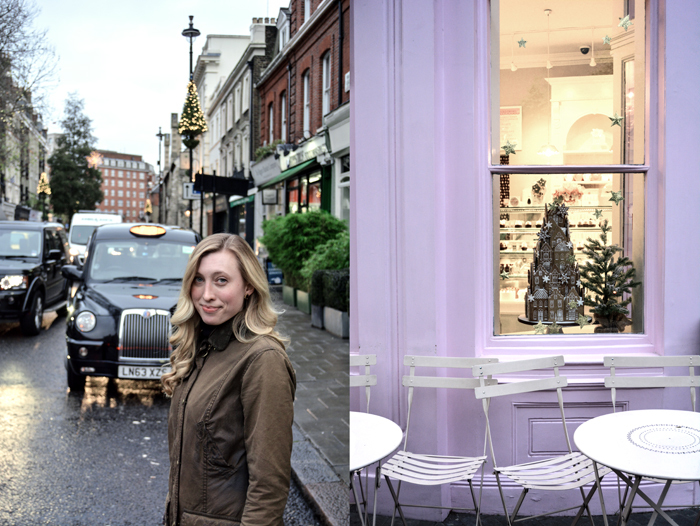 We have lived in one small area of London for the time we have been here, so we have been walking to the same florist, farmer’s market, chocolate shop, and so on for the duration. It is a comfort to know a place well, even if it is just your neighborhood. Our friends and family who live there. You graduated from Wellesley College, an all-women’s university in Massachusetts, where you studied Victorian literature. What was it like being at Wellesley, and what drew you to your subject? I was head over heels for Wellesley. Other than my husband, all of my closest friends are women. The strength of those relationships is due in part, I’m sure, to an education that placed the highest value on supporting other women. I was drawn to nineteenth century literature because I love novels, and that period was the heyday of the novel. I remember sitting in my dorm room with the windows open, curled in a chair with a piece of toast and Middlemarch (or The Woman in White, or Bleak House) and thinking—well this is heaven. As a travel journalist, you get to see the most beautiful places. Which of your recent trips struck you the most? I had a really wonderful time on the Royal Scotsman, a five-day train journey through Scotland. Having a whisky while watching the highlands go by is very difficult to top. The trip also begins and ends in one of my favorite cities, Edinburgh. You were an editor for Random House in New York and then a literary agent at WME in London, where you worked with lots of fantastic cookbook authors. What did you love about working on books about food? I have always been a great eater as well as a reader, so working on a few cookery titles as well as novels seemed like a natural fit. The company of other people who love to cook and eat is always such a pleasure. How do you develop new recipes when you are writing for Vogue? Slowly. 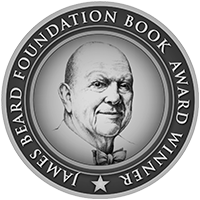 I generally begin with a dish I know very well, consider whether there is anything that could be improved, and then stress-test the recipe for consistency quite a few times before it goes to print. I did a piece on cranberry muffins recently, and the whole neighborhood was eating cranberry muffins for a month. Sugar cookies from The Joy of Cooking. I lost my head in the spice cabinet (Curry? Nigella? Why not) and left a huge, inedible mess. My mother was not pleased. We do the majority of our shopping within a few minutes walk of where we live. 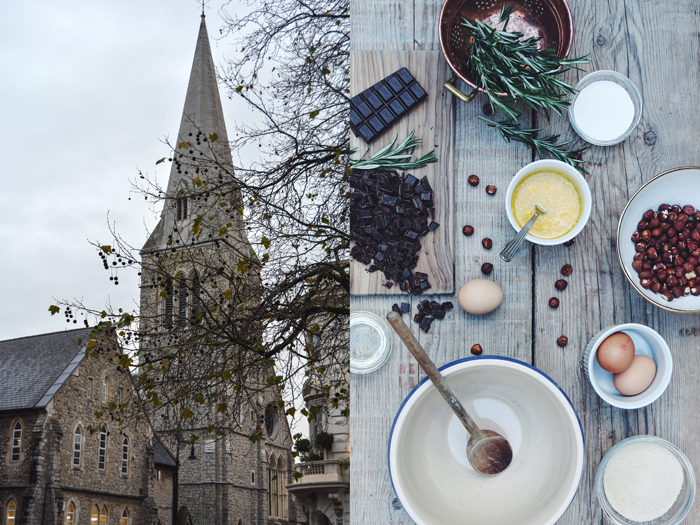 Daylesford for most groceries, William Curley for chocolate (the hazelnut and almond bark is my favorite), Polaine for bread, Partridges for wine, and our farmer’s market on Saturdays for meat and vegetables. Exceptions are dried pasta from Lina Stores, cheese from Neal’s Yard or La Fromagerie, and sourdough loaves from Brickhouse Bakery. If Andrew and I are eating out, we almost always go to a friend’s house for supper rather than a restaurant. Apart from the odd evening at Hunan, where they send course after course of the most brilliant Chinese food until you can’t eat any more (great fun when there is a larger group of people, and you’re absolutely starving), and the terrace at La Poule au Pot in the summer. For a rare treat, we might go to the River Café or La Petite Maison. 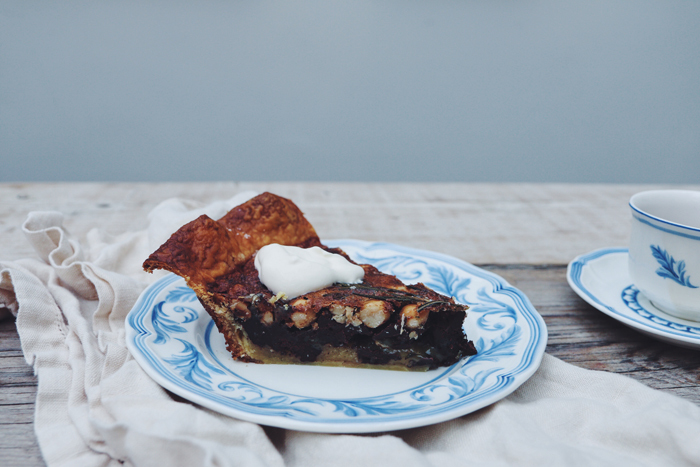 You share your Chocolate, Hazelnut, and Rosemary Pie recipe on eat in my kitchen. Is there a story behind this recipe? The three main components are ingredients that I adore; working them into a pie was an excuse to have them more often. I love to serve this at dinner parties in the winter, when there is still some red wine on the table, because it is wonderful with wine. My husband Andrew’s cavolo nero pasta with bread crumbs. I could eat it five nights a week. For something more exotic, anything cooked by Michel Guerard at Les Pres d’Eugenie. If I have a few hours notice, maybe a leg of lamb with gratineed potatoes, or beef bourguignon, because I so enjoy eating it. Always a few bottles of red wine, fresh bread, and a cheese course. Spaghetti carbonara, which I still love. I have so many favorites now, but it would probably have to be roasted chicken (lots of butter, thyme, and lemon over the top) with a green salad, and some good bread to scoop up the jus. I enjoy both. If I’m on my own I like to listen to something—opera or BBC radio 4, or maybe an audio book. When cooking with others, I like having someone else to taste things with. I don’t think I have one. There are plenty of things that I’ve made a mess of, but I’m incorrigible and always want to try again. I also came across Jo’s instagram and immediately couldn’t take my eyes of her writing corner. It’s wonderful to hear that she’s as lovely in real life as her chic photos present and fascinating to get to know her back story a little more. The recipe looks absolutely gorgeous and thank you both for writing and sharing the above. Love this lady! Thank you for doing this interview, it was a treat to read.